I hope spring comes to you soon! Soon they won't be needed. Winter warriors indeed! And one has fallen? :( Really hoping that spring will arrive soon! yes, it seems one warrior did not survive...so sad. Wow -- you even made the instruments of backbreaking work pretty! that one warrior is down for the count! Such colorful shovels! I see that one took one for the team...hopefully we'll be able to pack away the shovels soon! What are those? LOL Carl and I have never owned a snow shovel. Love the juxtaposition of the broken one in relation to the others! I love the colors. At first glance, I didn't realize one was broken. I love the colors--but I think winter must have been harsh, judging by the broken one. I definitely prefer the shovels as abstract art than as something I need to use! Poor Red Shovel, what a fierce warrior he (or she) must have been. Hopefully, for one and all, spring will be here soon. I have a scene very much like this outside my backdoor. Just not as colourful. Lovely! We broke 2 shovels this winter. I hope we don't need them again this season. Nice shot of some very necessary winter warriors! Looks like the snow is melting a little there though, and spring may be peeking around the corner! Poor little orange guy, he's all shoveled out. Haha! What a great shot. Heh... this was a bad year to be a snow shovel! It's doing it again out there. snow, hail and rain eeks. And yet...so colorful in composition. 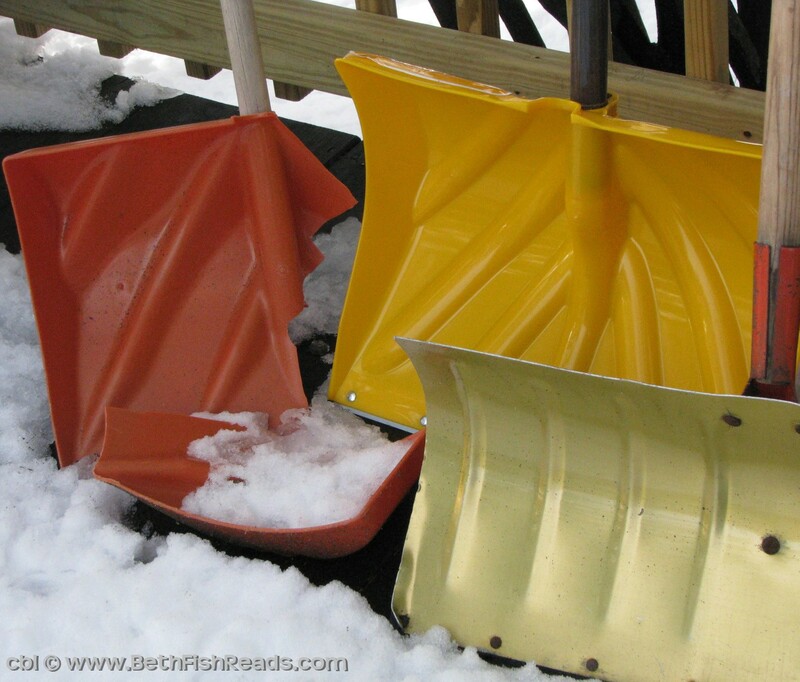 What happy colored snow shovels! It seems like their warm colors could melt the snow all by themselves. Hopefully we can put them away now. Our weather man told us not to put our shovels away, snow it on its way. I bought my husband a new sunny yellow shovel, but it doesn't help making it more pleasurable. I love the colors and composition. One's a little worse for wear, I'd say. Doesn't look like he'll see another season. I remember those days when we had to own a fleet of snow shovels. That poor red one is now retired, I see. Hopefully you won't have to use these too much longer. I love this picture! The colors and the way it is done is fabulous! So colorful! I had to blink - I thought they were candies on first impression. This solves a mystery - why all the stores sell out of snow shovels every bad winter. With all the snow you had this winter it's no wonder one didn't survive. ohhh when will winter go away?? !